Born in 1955, Vijaya Jadhav-Gatlewar is an ace performer and teacher of the Jaipur-Atrauli tradtition of khayal vocalism. Vijayatai was initiated into taleem by her father, Dinkar V. Jadhav, who himself was an exponent of the Jaipur-Atrauli gharana, having trained under Natthan Khan. He had also studied under senior musicians of the Agra and Gwalior gharanas. In 1977 she was put under the tutelage of Nivruttibua Sarnaik. When Nivruttibua was invited to become a Resident Guru at the ITC Sangeet Research Academy, Calcutta, in 1978, she also went along and trained with him there till the end of his tenure at the Academy in 1993. 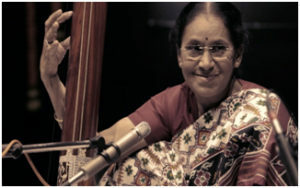 While at the Academy, she received guidance from the legendary Girija Devi in Thumri and other allied genres. Vijayatai’s music is a blend of traditional gharanedar music and her own strong individual style. Her dum-saas, intricate taankaari, complex rhythmic patterns and behlawas are indication of her thorough understanding of the gayaki of the tradition she belongs to. She also has a mastery of jod-ragas, another Jaipur specialty. Apart from raag-sangeet she also excels in lighter forms like Thumri, Dadra, Kajri, etc. On returning from Calcutta in 1993, she completed her M.A. in Music from Mumbai University, and has been training students since then. Currently she is appointed as a Guru at the prestigious Gangubai Hangal Gurukul, Hubli. She an ‘A’ graded artist, and is regularly heard on AIR and television. She was conferred the Surashri Kesarbai Kerkar Scholarship by NCPA, Mumbai in 1979. She was awarded the prestigious ITC Sangeet Research Academy Fellowship. She received the Best Singer Award from the Bharatiya Sanskriti Sansad, Calcutta in 1989.